With the recent news that may not come as a shock to many of you, British drivers have been found to be the worst country for road rage. 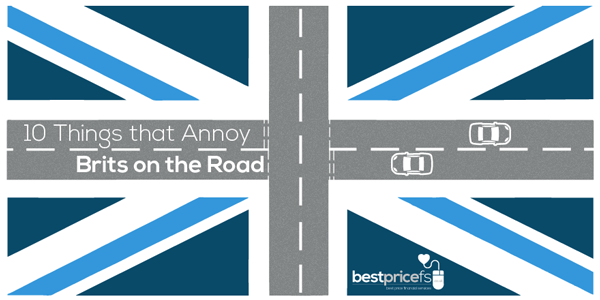 That’s why we’ve decided to put together a list of 10 of the worst bugbears Brits have to battle with on the road. Warning: these may just drive you to the edge. Cruising along and causing a bit of a blockage, middle-lane drivers are the scourge of the road system. Compared to our transatlantic counterparts, here in the UK we pride ourselves in our motoring management. So let’s keep it on track, eh? Cyclists are often treated as second-class citizens on UK roads, and for the most part this is pretty undeserved. However, when they start to flout the rules, it’s no surprise that many of us reasonable road-users see red. A legal requirement and downright dangerous, zipping through zebra crossings can cause more than just a kerfuffle. Just like a leopard can’t change its spots, these zebra’s stripes are here to stay, so it’s time for drivers to start stopping. Amusing or annoying? You decide. Either way, it’s easy to be startled after hearing the rumble of a supercar, only to find an old banger bumbling round the corner, and even more so when they’re whizzing past your windows late at night. So you’ve had an accident and your car’s in for repairs. Expense and inconvenience aside, you’ve traded it in, only to find you’ve been palmed off with a pretty rubbish replacement. Say no to the nonsense and make sure your policy covers you with like-for-like. This is a habit over which many Brits have a bee in their bonnet. When a driver doesn’t indicate, how can we be expected to predict their every move? After all, we’re not mind-readers! Not only is this illegal, it’s also plain stupid, and seeing another driver on their phone can make even the most mild-mannered Brit’s blood boil. Many motorists think of themselves as multi-tasking magicians, but in reality, texting or taking a call really isn’t worth the risk. As if getting out of your bed wasn’t hard enough, when the chill hits, it can be a drag getting your car going too. Thawing is boring, especially when it makes you late, so it’s a good job it’s only for three months of the year. Whether you’re a minute over the time limit or an inch over the line, you can guarantee to be greeted on your return by a not-so-fine fine stuck to the windscreen. We know you have quotas to fill and days to ruin, but really, one minute?! Have a little heart. Mini Cooper or monster truck? The way some motorists make their manoeuvres, it seems they may be a little confused themselves. The battle for spaces at the supermarket can be hard enough as it is, so seeing somebody straddling the lines and taking up valuable parking spots can really grind our gears. Enjoyed these five minutes of fury? Follow @bestpricefs for more factual fun. Best Price FS provide unlimited like-for-like vehicle for non-fault accidents for only £9.99. Learn more about Motor Legal Protection.